Recently I participated in a Strawberry Pincushion swap hosted by the lovely Erin from Why Not Sew? You may remember my gifts to my recipient here. I am headed to the post office in a bit to retrieve my swap parcel. 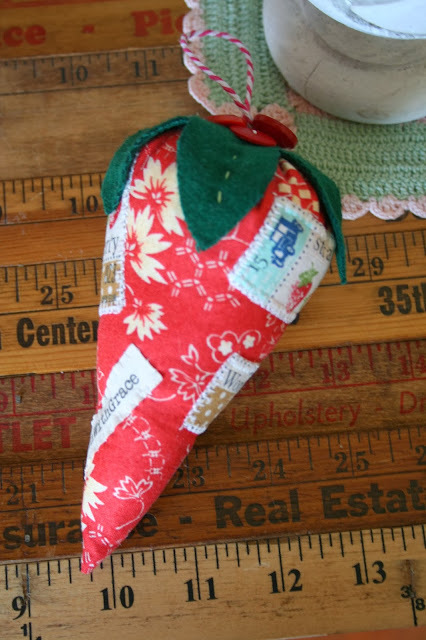 I wanted to thank Erin for hosting such a fun swap so I made her this pillow and pincushion. I hope she has received it and I'm not spilling the beans on my blog! I want to participate in more swaps because this was such a great experience. I'll be back tomorrow to show you what I received. Be sure to pop over to Erin's blog where she is hosting a giveaway for some fabulous Honeysweet! Blessings! Love those!! The pillow is so cute!! Oh my goodness! I didn't receive it yet but I'm going to go sit by my mail box today :) Everything looks gorgeous! I can't believe you are sending it to me. I will let you know when it comes. Thank you so much, Renee! I love strawberries, I'm sure she loved her pillow! I have to wait until tomorrow to see if it comes. Today is Columbus Day. Erin, I knew it was Columbus Day and still went to the post office to get my box from my swap partner, of course it was closed. I felt so stupid! I have that pattern and can not wait to make something with it! 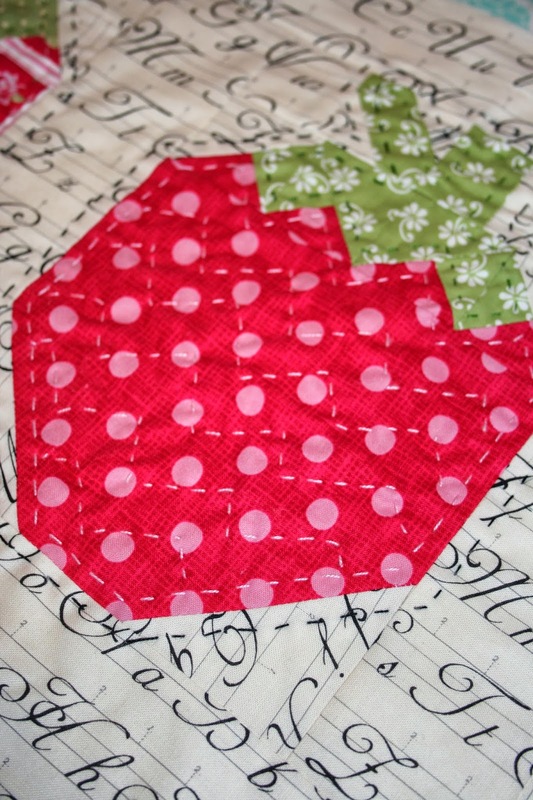 An adorable pillow and such a sweet strawberry pincushion!! So thoughtful of you!! I love the text print too!! I love the strawberry pillow...it looks sweet & cozy! Oh I love these! 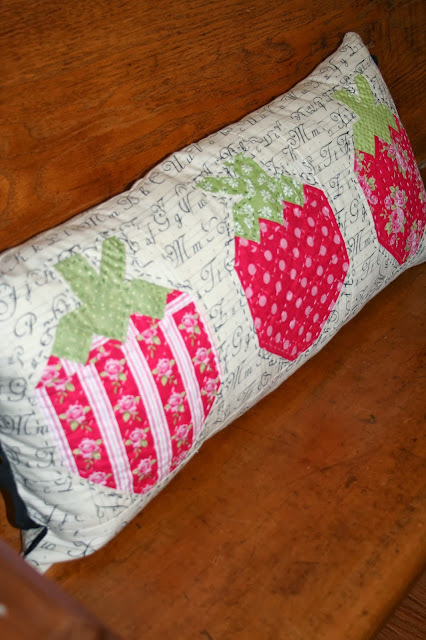 The long strawberry pillow is fabulous! Now those are adorable. Putting those little tiny patches on the pincushion was no easy feat!! I'm sure she will love your sweet gesture. I participated in a swap last year and it was alot of fun. I'd love to do it again sometime. 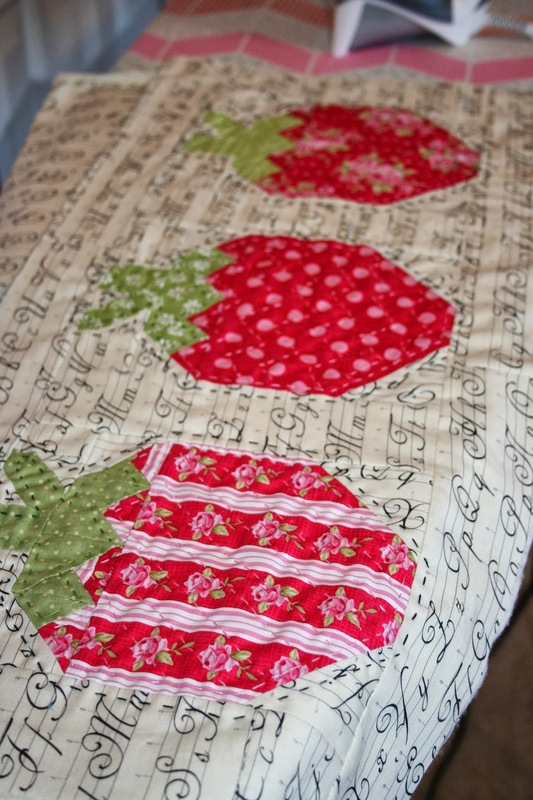 love that calligraphy fabric in the strawberry pillow. who makes it?